Album Info: Operations around Kitchener, Ontario, Canada. Including frieght and passenger trains as well as rolling stock and track. Description: This small yard services the industries around the Kitchener-Waterloo area. Located between Lancaster St. and Hwy 7 beside Victoria St. The engines are kept at the VIA/GO Station on two sidings. The yard is joining the main line on the extreme right of the photo and a passing siding beside. There are three arrival/departure tracks and five collection tracks. Description: GSCX 7369 pulls out a string of cars from the storage tracks. Description: The mixed pair of SD40-2's pushes the string of cars back onto a storage siding to pick up some more cars. Description: The short train moves out of the yard onto the passing siding. Description: The trian crosses Lancaster St. to the crossover from the passing siding to the mail line. Description: With the work in the yard complete the crew catch a ride to the next switch. Description: The train has now been moved to the main line and once both switches are closed the yard crew will move to the engine for the remainder of the job. Description: Spotted in the back corner of the Kitchener yard this tank car has obviously rolled. Description: Showing severe damage to the end platform. 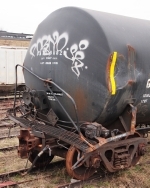 Spotted in the back corner of the Kitchener yard this tank car has obviously rolled. Description: Spotted in the back corner of the Kitchener yard this tank car has obviously rolled with the damage to the platform and tank. Notice tracks running into the earthen burm making an economical end of track device.